We are always surprised when we talk to our local friends and they tell us they have never done the VICTORY COLUMN CLIMB . Come on! It IS one of the coolest views of Berlin. We’ve done it a thousand times and whenever we walk by it, we feel like climbing it all over. No matter how tough the “Stair Master” experience can be. 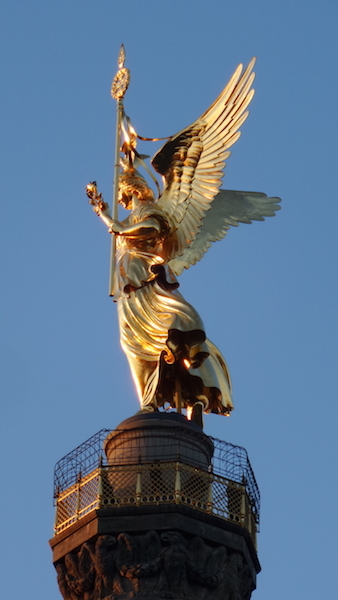 First a short background on the monument: In German it is known as “Siegessäule. ” The column was designed by Heinrich Strack in the 1800s to commemorate the Prussian victory in the Danish-Prussian War. The massive bronze sculpture of “Victoria” (designed by Friedrich Drake) measures over 8 meters and weighs 35 tons. The monument sits in the middle of Tiergarten Park (not its original location) and has become one of Berlin’s major tourist attractions. Make your way to the middle of the park. To get to the column, use of the underground passage ways. Do not try to cross the surface streets. There’s an entrance fee (not expensive…something like 3 euros). Follow the flow and small exhibit to the first stage. 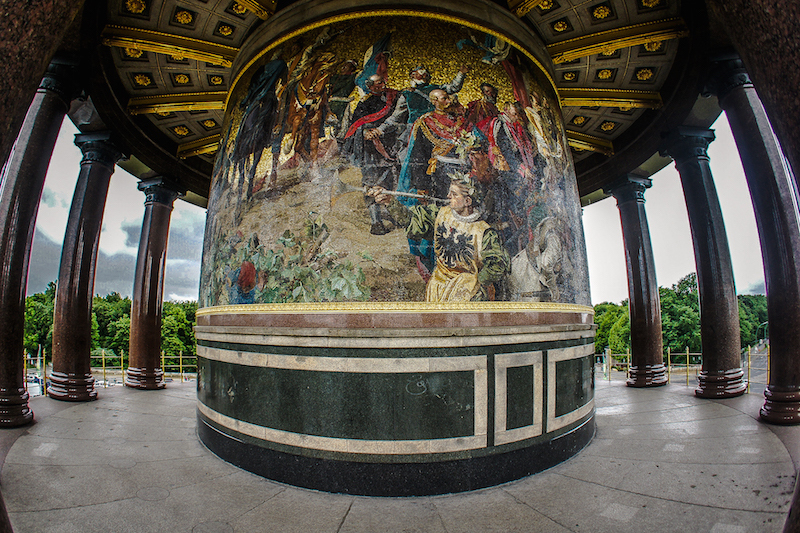 Make sure you get out and admire the amazing mosaic work around the bottom part of the column. Start your climb and make sure you pace yourself. It can be somewhat challenging. Especially for kids and not active adults. Trust us, though. Your effort will be rewarded. 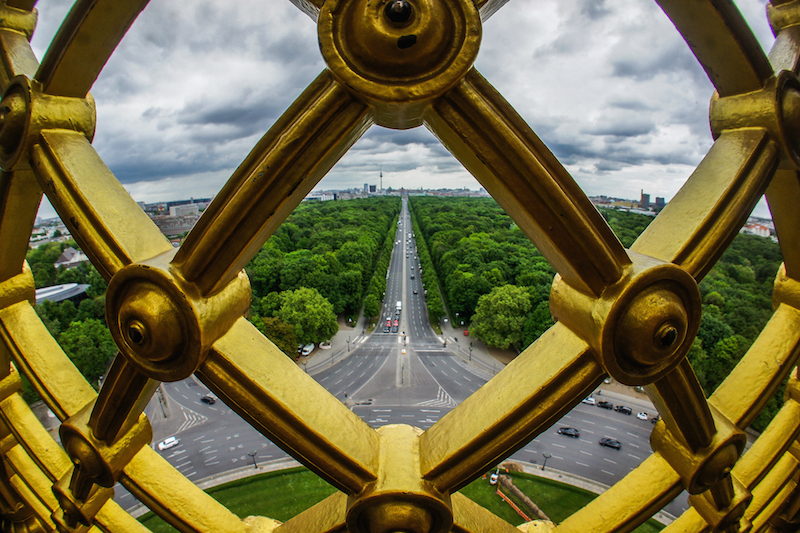 Once you get to the top, you will have one of the coolest views over Berlin. No matter what time of the year the view is breathtaking. 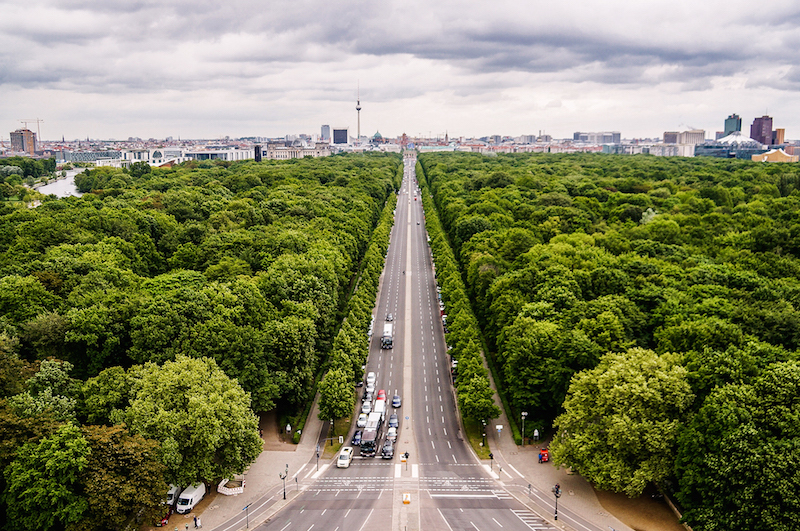 It is great to observe the foliage of Tiergarten from above, especially during Spring and Fall. A fun thing to do is to try and recognise of the Berlin’s landmarks as you go around the column. Take a map with you so you can orient yourself. Make sure to climb the column on clear and sunny days to get the best experience. Although it can also be quite interesting to climb up on gloomy days. That will give you a true “Win Wenders”, “Clouds over Berlin” kind of experience. If you don’t know what we’re talking about, make sure to rent the movie before coming to the city. Also prefer to go earlier in the day as it tends to be less crowded. As you are already smack in the middle of the park, make sure to explore it. It is gorgeous! 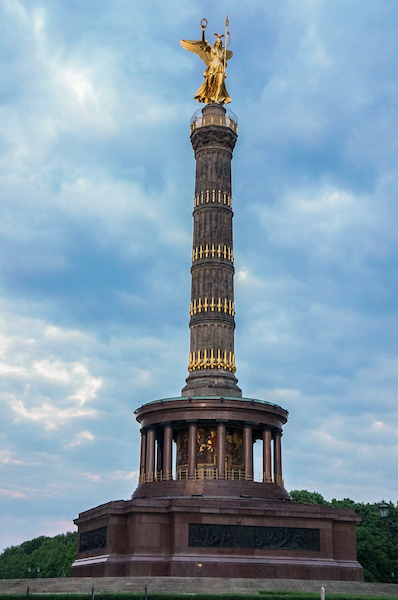 MORE INFORMATION ON THE VICTORY COLUMN CLIMB.